Grand Velas Riviera Maya is launching an innovative and exciting new activity that transports guests around the country and back in time with it new ancestral drink tasting. Grand Velas Riviera Maya is launching an innovative and exciting new activity that transports guests around the country and back in time with it new ancestral drink tasting. 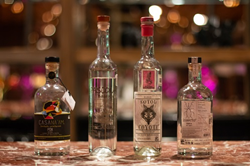 With a tasting of bacanora, sotol, tuxca, and pox, guests will learn how these ancestral recipes came to be and how they are being reinvented and reintroduced to a modern palate with cocktail recipes. Included in the nightly rate, the Ancestral Drink Tasting will be held weekly starting over the Christmas holiday. Derived from the Pacific Agave which grows wild in the northern Sonoran region of Mexico, bacanora can trace its beginnings to over 300 years ago. During the workshop, guests will taste the bacanora, a naturally fermenting, 100% agave artisanal drink. The liquor has an almond scented finish on both the nose and palate. Next up is sotol which finds its roots in the wild plants of Dasylirion, a genus of North American plants in the asparagus family, all native to Mexico. Totally organic with spear-like leaves, it can take upwards of 15 years for these plants to mature enough to harvest. Hailing from Durango, the leaves of the Dassylirion are distilled by grinding by hand and then fermenting in plastic tubs for 3 days, followed by a double distillation in stainless steel craft stills. Known for its pine and hazelnut aroma, the liquor has a medium viscosity and a sharp herbaceous edge to the taste. Tuxca dates back to the 16th century in the vicinity of the Snow and Fire volcanoes, south of Jalisco and North of Colima. This handmade mezcal relies on over 20 varieties of different agaves to imbue its liquor. The proximity to the volcanic region adds an element of minerality to the liquor. Baked in a conical oven in the ground, tuxca is fermented in the volcanic stone and offers a double distillation. Lastly, guests will taste pox, born from the ancient springs discovered by Mayan ancestors. Fermented from sugarcane, brown sugar, wheat and fresh spring water, the elements meld in oak containers until fully finished. Representing a link from land and water, this fresh and slightly oaky drink from Chiapas holds both the naturally fresh and clean flavor of water and the woodsy hints from land.